When you get a new pad of paper are you like a bunny in a carrot patch? Me too! But then I squirrel it away. Ahem. Well, it’s time to let that paper come out and play, with Online Card Classes’ newest class: Pattern Play! 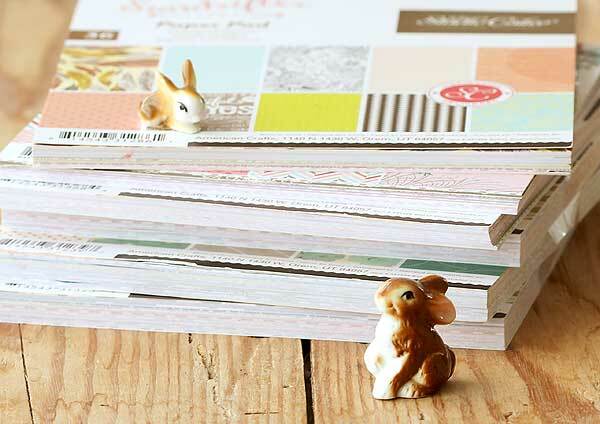 Love pretty patterned paper? Grab your favorites and join Kristina Werner, Jennifer McGuire and friends (including me!) for Online Card Classes’ newest class – Pattern Play. Make the most of your patterned paper stash while learning tips and tricks and discovering both clean-and-simple and advanced techniques. Pattern Play includes many card ideas – all with videos – and a variety of card styles. Add step-by-step pdfs, a forum, giveaways, shopping discounts, additional inspiration and a gallery, and you’ll be ready to use your pretty papers in fun new ways. Class runs March 18-25 but you will have lifetime access to the content. Sign up now for only $16! So thrilled to be a part of this class. Want to win a spot? Just leave a comment on this post with something that you love about spring by FRIDAY! Updated at 9:45 on Saturday, March 16: the lucky random winner is #85, Margie Visnick! Margie, I emailed you. Happy spring and hope to see everyone in class! I love this quote about Spring; “Spring doesn’t come. It’s the world. It goes- BING! Like a SPRING!! I love the blooming of all the bulbs planted in the fall. I’d love a place in the class. Can’t resist the stuff. So many choices. What I love about spring? Warm sunshine!! I love the lighter, longer days, and the budding trees! Love this idea for this class–I have SO much paper and never quite sure how to use it. It’s Friday and I’m in love! Friday means family game night for me and the kiddos!!!! Thanks for the chance to win! Definitely live all the flowers! Also getting the kids outside to play. Cabin fever has set in. My favorite part about Spring is the weather. I love the sunny, mid 70 degree days because those types of days are rare here in Texas. Love all the pretty blooms in spring! Looks like a fun class! Thanks for the chance to win a spot! Always happy to see the crocuses peek out of the frozen ground. I’m loving the fact that I can start gardening and seeing the bunnies hopping around. Thanks for the chance to win. BTY, what a cute photo! Thanks so much for the chance to win. Something I love about spring is all the flowers popping up everywhere. They make me happy. Have a huge stash of patterned paper so this would help me get going on using it more. Would love a spot in the class! Thanks. I can’t wait until class starts on Monday…Woo-Hoo!! !